Long Beach residents heard three options for regulating Airbnb and other short-term rentals at a meeting Oct. 10, 2018. Photo by Valerie Osier. After a seven-month process of hearing community feedback, Long Beach showed residents three potential options for regulating short-term rentals at a Wednesday-night meeting, but many hosts still spoke in favor of no regulations. Airbnb and other short-term-rental hosts called it “option zero,” or no regulations. Long Beach can ultimately decide to go that route, but city consultants said their job is to provide viable regulation options for the City Council to consider. Council members will consider the three options—each getting progressively more restrictive—at a Nov. 13 meeting before an ordinance is drafted and goes to public hearings. “We live in a very diverse city and short-term rentals affect this area very differently than other areas of the city,” Councilman Al Austin said. The meeting took place in Bixby Knolls at his field office at the Expo Arts Center. Short-term rentals are speckled around the city but cluster mostly in Downtown and the coastal areas. City consultants considered 600 online survey responses and 130 scorecard surveys that were passed out at the last community workshop in July. For some hosts, these requirements are redundant. “All this stuff is already established,” said one host, Emma Valenzuela. She said most hosts already post house rules, and Airbnb already provides $1 million in host insurance. 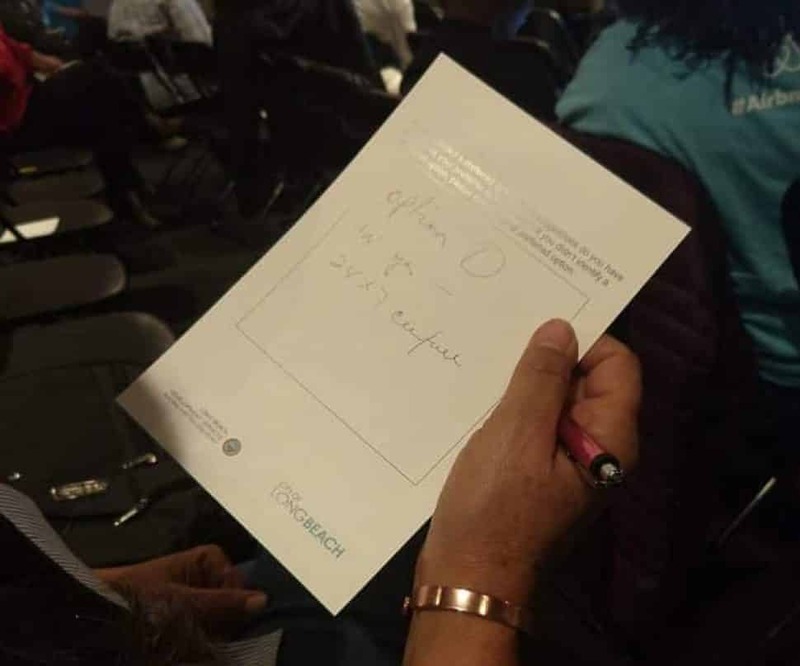 Emma Valenzuela, a short-term rental host, shows her comment card stating she would rather have “option zero” or no regulations on short-term rentals. Photo by Valerie Osier. Residents can have two short-term rentals or three if one is a primary residence. Multi-unit buildings are limited to 25 percent of total units, or up to six short-term rentals, whichever is fewer. In two- or three-unit buildings, one short-term rental is allowed. Hosts are limited to 90 nights of guest stays without the host present in a primary residence short-term rental. In a non-primary residence, there is no limit. Residents must have lived in the primary residence for more than 60 days before registration is approved. Large-scale events are not allowed. Quiet hours are from 10 p.m. to 7 a.m. including pools and outdoor hot tubs. There’s a maximum of 10 people at once allowed, with a limit of two people per bedroom plus two. Neighbors can petition to prohibit un-hosted short-term rentals within a designated area. The city has not determined how the areas will be divided yet. All the options include the city’s ability to fine short-term rental operators for violations of the ordinance. The first violation will cost the host $500, the second will cost $1,000, and the third will revoke the city registration. Another host said that while she doesn’t live at her property and it’s often used for events, she makes sure her guests don’t cause noise problems with an app called Noise Aware, which measures the noise levels in her home at all times. Other hosts echoed that they use technology like intercoms to keep an eye on their units and to make sure their guests aren’t causing issues in the neighborhood. While some hosts use preventive measures, some residents spoke out against the “bad neighbor” hosts, who regularly allow loud parties or turn entire apartment complexes into short-term rentals instead of affordable housing. Theresa Marino, a Bluff Heights homeowner, said she’s in favor of hosts using their houses as short-term rentals, but she wants the city to prohibit apartment complexes from being turned into short-term rentals. The City Council will hear the final option recommendations at their Nov. 13 meeting.